Happy Veterans Day! Thank you to all those who have served and are still serving this great nation! 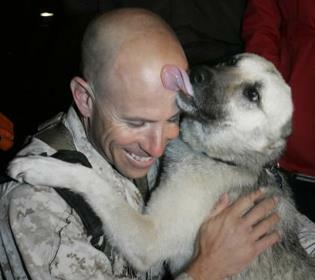 Even the military canines, you are not forgotten. Did you know that every military working dog is a non-commisioned officer- some rank higher than their handler? and in 2000, Congress passed a bill so that military dogs can be adopted by their handlers! Check out this heart warming story about a Mutt, Marine and a Miracle. The story of a San Diego dog reunited with his owner in the dangerous terrain of Iraq is nothing less than a miracle. In 2007, Nubs was an Iraqi dog who had a rough start in life. He was used as a fighting dog, was badly abused, and ran in a pack of dogs in Al Anbar Province. Nubs’ ears were cut off to make him look tough and to make fights last longer since there is almost no ear left to be injured. (The same thing is done to US dogs used for fighting.) Things started looking up though for Nubs when he was rescued by Marine Major Brian Dennis. Major Dennis took care of Nubs for 4 months. Then the Marine was ordered to move his squadron and had to leave Nubs behind. Two days later and 70 miles away, Nubs appeared at the squadron’s new location ( Iraqi Dog Walks 70 Miles to find soldier )in 18 degree weather and found Dennis. “I couldn’t believe that Nubs was able to find me so far away. It was truly remarkable “, said Major Brian Dennis. While on base, Dennis continued to care for Nubs as his own, until he was informed that the dog had to go as it was time for camp to relocate. Major Dennis didn’t let this remarkable dog down. He got Nubs into Jordan, found a family there to care for him, and will be transporting Nubs to the US. What a lucky dog and what a compassionate human! Since then, both Major Dennis and Nubs have been all over the media among ABC, CBS, Jay Leno, David Lettermen, and the Ellen Degeneres Show sharing the remarkable story which has both changed their lives, and touched the hearts of dog lovers all over the world. In honor of the inspiring story between Marine and Mutt, in 2012 a San Diego based non-profit organization was created by a man who has an unconditional love and lifetime passion for working with animals. His non-profit rescues shelter dogs and trains them for military service members in need of companionship. 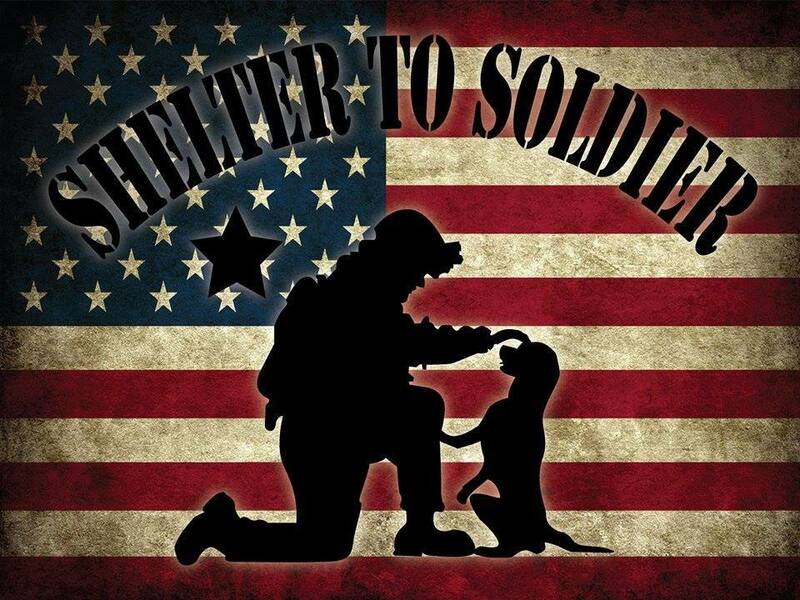 Shelter to Soldier created by Graham Bloem began to get a lot of attention from the media, military and pet communities. While his job entails canine training, helping dogs with behavioral modification, introducing dogs to families, while rescuing thousands of dogs in the process, his true passion lies in helping dogs help people. In addition to his ventures in training service dogs for clients with disabilities, Graham has also been actively involved in the efforts of several military servicemen in rescuing dogs from Iraq and training and introducing them into their new homes in the United States. Major Brian Dennis and the inspiration for this NY Times Best Seller, Nubs. Graham’s most notable experiences have been with Major Brian Dennis and Lt. Col. Jay Kopelman. 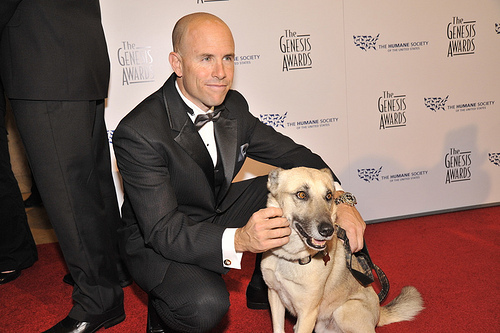 Major Brian Dennis is an F18 pilot of the United States Marine Corps and in 2009,he became the New York Times Best Selling Author of Nubs – The True Story of a Mutt, a Marine, and a Miracle, a miraculous story of the loyalty between a soldier and his dog. Lt. Col. Jay Kopelman of the United States Marine Corps is also a New York Times Best Selling Author of From Bagdad with Love and From Bagdad to America, stories of a soldier describing the struggle with PTSD and his journey with his dog Lava after serving tours in Iraq and Afghanistan. Graham has had honorable mentions in all of these books for his help in guiding these Iraqi dogs to their new lives in America with their heroic Marines. Through his journey over the past several years in dog training and his incredible opportunities to honor our military men and women through his dog training skills, Graham’s mission to combine his expertise in order to give back to those who serve our country has evolved into Shelter to Soldier™. In 2012 creator of Barking Beast San Diego, Tania Milberg teamed up with Major Brain Dennis and Shelter to Soldier Founder Graham Bloem to shoot a documentary about the admirable work and obstacles within the everyday realities of the non profit organization. Milberg, an avid animal and dog lover heard about Bloems work through from Public Relations Director at Rancho Coastal Humane Society of Encinitas, CA, John Van Zante. 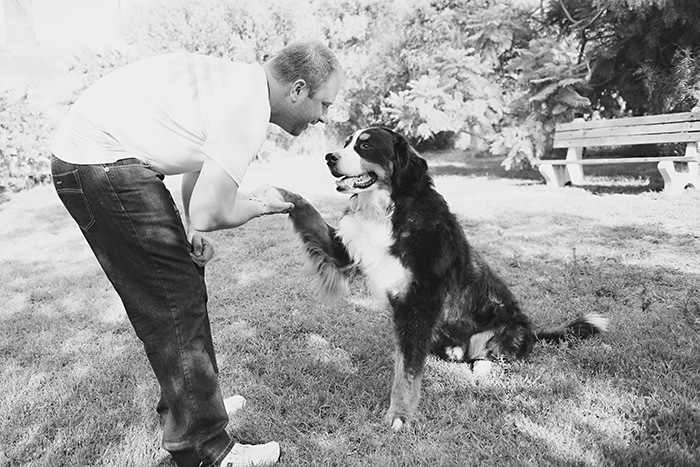 “When John told me about Graham’s work and his effort not only to help shelter dogs, but returning military service members, I knew I had to meet him and put a piece together on their story”, Milberg stated. Since then Milberg has put forth a collaborative effort in producing a film produced about the speciality trainer and the solider set to debut in January 2014. Check out Graham Bloems site for more information on how you can help and make donations at Specialty Dog Training. Next Movie Must See: The Secret Life of Pets!